Joe Hartmann hasn't abandoned the old Ford Falcon station wagon, chugging along at more than 200,000 miles with the symbolic license plate befitting a baseball lifer: BUNT. 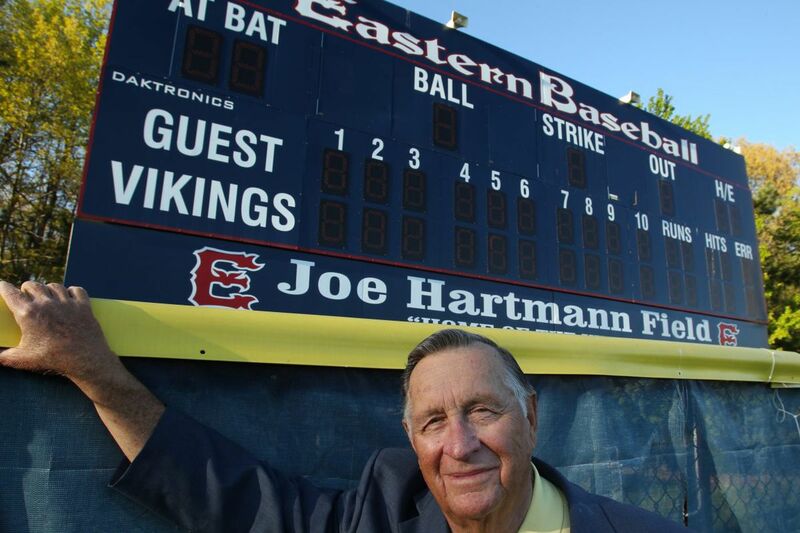 In his coaching days at Eastern, Hartmann loved to bunt, with a special affinity for the suicide squeeze. But the license plate has a more symbolic meaning that transcends baseball and gives a hint to the humanitarian personality of the 86-year-old South Jerseyan. "There is symbolism to the license plate," Hartmann said this past week. "What does bunt mean? In baseball parlance, it means sacrifice." How fitting for somebody who has put others before himself while making the baseball experience so special for scores of South Jersey players over more than six decades. Hartmann already has two fields and a tournament named after him. On Jan. 15, he will receive another prestigious honor when he accepts the 2018 Ed Snider Lifetime Distinguished Humanitarian Award from the Philadelphia Sports Writers Association. It will be presented at the PSWA's annual awards dinner at Cherry Hill's Crowne Plaza Hotel (tickets: www.phillysportswriters.com). To see those honored shows the kind of elite company that Hartmann is keeping. Previous recipients include Snider, the late founder of the Flyers; the late Lewis Katz, a well-known philanthropist and sports entrepreneur; former Eagles general manager Jim Murray; David Montgomery and Phillies Charities; and Flyers Wives Charities. "It's an honor," Hartmann said. "They were kind enough to give me this award." Hartmann isn't comfortable accepting awards and would much rather fly under the radar. "I am not big on these things," he said. "I do it because there is a need and I will fill the void if I can. I would think most people would fall in that category." Where does one start talking about what Hartmann has meant to South Jersey? He began what was known as the Diamond Classic, which has evolved into a 16-team tournament matching South Jersey's top teams. It is now called the Joe Hartmann Diamond Classic, and it's one of the most anticipated events of the South Jersey baseball season. This year's will be the 47th annual edition. Before that, 50 years ago, in fact, Hartmann formed the South Jersey Baseball Coaches Association, an organization that honors the top players. That organization also has donated nearly $30,000 to the Walter Reed Society, dating to the Gulf War. Hartmann has been involved in the Carpenter Cup, the all-star high school tournament of teams from the tristate area, since its inception in 1986. It is one of the best tournaments in the country, with the semifinals and championship game played at Citizens Bank Park. Hartmann was the original manager of the Olympic-Colonial team and still helps out with the franchise. A former mayor of Gibbsboro and former longtime athletic director at Eastern, Hartmann also was instrumental in the formation of the New Jersey Scholastic Coaches Association all-star baseball game that debuted in 1978. Anything that helps youths get a chance to play in front of college and pro scouts, Hartmann has been at the forefront of it. "For Joe, it has always been about the kids and the pure goodness that he is all about," said Bishop Eustace coach Sam Tropiano, who has worked closely with Hartmann on many baseball projects. "He has been such a positive influence for all the coaches." Hartmann, who was a part-time scout for the Tampa Bay Rays until giving that up last year, got an early start on coaching. A 1949 graduate of Haddonfield High, he was helping coach Little League while still in high school. "The friendships I have made through baseball have been special," Hartmann said. All the work he has done has been just as special, which is why Hartmann will be honored, appropriately, for a lifetime of giving back. Ticket information: Visit www.phillysportswriters.com or email pswadinner@yahoo.com.